After the crisis, the world’s major central banks attempted to revive spending and employment by slashing interest rates. The big disappointment in the world economy today is the low rate of investment. In the years leading up to the 2008 financial crisis, growth in high-income countries was propelled by spending on housing and private consumption. When the crisis hit, both kinds of spending plummeted, and the investments that should have picked up the slack never materialized. This must change. After the crisis, the world’s major central banks attempted to revive spending and employment by slashing interest rates. The strategy worked, to some extent. By flooding capital markets with liquidity and holding down market interest rates, policymakers encouraged investors to bid up stock and bond prices. This created financial wealth through capital gains, while spurring consumption and – through initial public offerings – some investment. Yet this policy has reached its limits – and imposed undeniable costs. With interest rates at or even below zero, investors borrow for highly speculative purposes. As a result, the overall quality of investments has dropped, while leverage has risen. When central banks finally tighten credit, there is a real risk of significant asset-price declines. As monetary policy was being pushed to its limits, what went missing was an increase in long-term investments in high-speed rail, roads, ports, low-carbon energy, safe water and sanitation, and health and education. With budget austerity restraining public investment, and major uncertainties concerning public policy and international taxation hampering private investment, such spending has generally declined in the high-income countries. Despite US President Barack Obama’s promises of investment in high-speed rail and other modern infrastructure, not one mile of fast rail was built during his eight years in office. It is time to translate words into action, in the United States and elsewhere, and usher in a new era of high investment in sustainable development. There are three challenges facing such a strategy: identifying the right projects; developing complex plans that involve both the public and private sectors (and often more than one country); and structuring the financing. To succeed, governments must be capable of effective long-term planning, budgeting, and project implementation. China has demonstrated these capabilities in the last 20 years (though with major environmental failures), whereas the US and Europe have been stymied. The poorest countries, meanwhile, have often been told by the International Monetary Fund and others not even to try. Today, governments will have some help in overcoming at least one of the key challenges. The Sustainable Development Goals (SDGs) and the Paris Climate Agreement will help to guide them toward the right projects. The world needs massive investments in low-carbon energy systems, and an end to the construction of new coal-fired power plants. And it needs massive investments in electric vehicles (and advanced batteries), together with a sharp reduction in internal combustion engine vehicles. The developing world, in particular, also needs major investments in water and sanitation projects in fast-growing urban areas. And low-income countries, in particular, need to scale up health and education systems. China’s “one belt, one road” initiative – which aims to link Asia to Europe with modern infrastructure networks – will help to advance some of these goals, assuming the projects are designed with a low-carbon-energy future in mind. That initiative will boost employment, spending, and growth, especially in the landlocked economies across Eurasia. It should even deliver new dynamism to economic and diplomatic relations among the European Union, Russia, and China. A similar program is needed urgently in Africa. Although African countries have already identified priority investments for electrification and transport, progress will remain slow without a new wave of investment spending. African countries’ combined spending on education alone should increase by tens of billions of dollars per year; combined infrastructure spending should surge by at least $100 billion per year. These needs should be covered mostly by long-term, low-interest-rate loans from China, Europe, and the US, as well as by mobilizing African countries’ long-term savings (through, for example, the introduction of new pension systems). 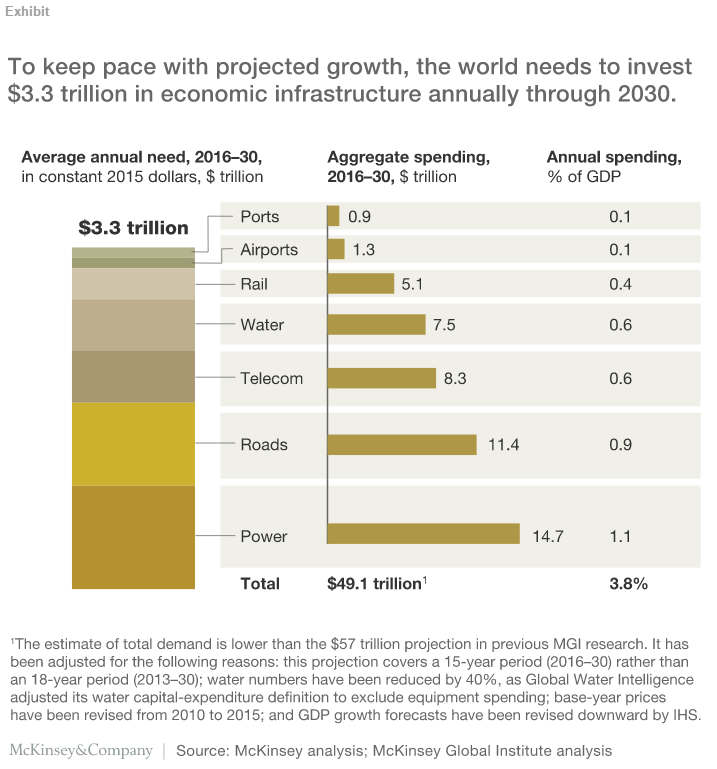 The US and Europe also need major new infrastructure programs. The US – where the last big infrastructure project, the national highway system, was concluded in the 1970s – should emphasize investment in low-carbon energy, high-speed rail, and the mass uptake of electric vehicles. As for Europe, the European Commission’s Investment Plan for Europe – dubbed the “Juncker Plan,” for Commission President Jean-Claude Juncker – should become the EU’s SDG program. It should focus, for example, on creating a Europe-wide transmission grid for low-carbon energy, and on a massive increase in renewable-power generation. To help finance such programs, the multilateral development banks – such as the World Bank, the Asian Development Bank, and the African Development Bank – should raise vastly more long-term debt from the capital markets at the prevailing low interest rates. They should then lend those funds to governments and public-private investment entities. Governments should levy gradually rising carbon taxes, using the revenues to finance low-carbon energy systems. And the egregious loopholes in the global corporate-tax system should be closed, thereby boosting global corporate taxation by some $200 billion annually, if not more. (American companies are currently sitting on nearly $2 trillion in offshore funds that should finally be taxed.) The added revenues should be allocated to new public investment spending. For the poorest countries, much of the needed investment should come through increased official development assistance. There are several ways to generate that extra aid money via a reduction of military spending, including by ending the wars in the Middle East; deciding firmly against a next generation of nuclear weapons; cutting back on US military bases overseas; and avoiding a US-China arms race through enhanced diplomacy and cooperation. The resulting peace dividend should be channeled toward health care, education, and infrastructure in today’s impoverished and war-torn regions. Sustainable development is not just a wish and a slogan; it offers the only realistic path to global growth and high employment. It is time to give it the attention – and investment – it deserves.